The SWAC Championship Game is back from the dead in 2018. Here’s a look at the history of the game. 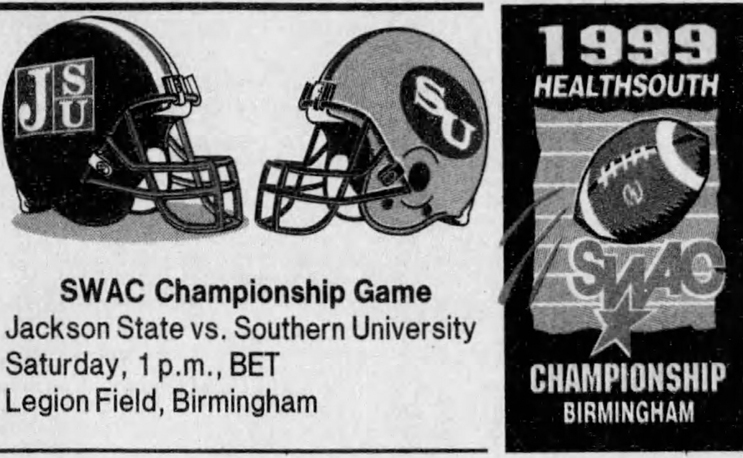 Back in 1999, the SWAC decided to send its two best teams to a championship game instead of the playoffs. Here is a look back at how each team has fared during the Championship Game Era. Valley holds the distinction as the only SWAC team never to win or even make the SWAC Championship Game. In fact, they’ve never won a SWAC title period. It’s pretty amazing when you consider the players that have worn the red and green. Despite being in football talent-rich Texas, Texas Southern has never really been a powerhouse on the field. It did manage to make it to the 2011 title game and win, beating Alabama State 11-6, but that loss was later vacated due to NCAA violations. So TSU is technically winless in the championship era. Like its Texas neighbor, TSU, Prairie View has struggled to make it to the championship game in the SWAC West. It’s lone win and appearance came in 2009 when head coach Henry Frazier led PVAMU to a 30-24 win over Alabama A&M for its first SWAC title since 1964. Pine Bluff broke Grambling and Southern’s streak of eight straight SWAC West champs from Louisiana in 2006, but dropped the ball by losing to Alabama A&M 22-13. It would have to wait six more years to get back to the big show, but this time it finished the job as it edged out Jackson State 24-21 in a thriller in 2012. After falling to Grambling State and Southern in 2001 and 2003, ASU finally broke through in 2004 with future NFL QB Tavaris Jackson at the helm. Since that early run of SWAC East titles, though, ASU has made just one appearance in the title game, losing to Texas Southern. JSU nearly won the first SWAC Championship Game back in 1999, then didn’t make it back again until 2007. Led by Rick Comegy, JSU got revenge from its 1999 loss with a 42-31 win over Grambling. That would be the high point of JSU’s championship appearances as it would lose in 2008, 2012 and 2013. AAMU has made more appearances (6) than any school not named Grambling in the championship game. Unfortunately for AAMU, it has just one win in those appearances. That win came in 2006 when it beat UAPB 22-13. Alcorn was the last team from the SWAC East to make the championship game, but it has had the most success so far. Fifteen years after the SWAC went to the championship game format, ASU finally got there in 2014. It dethroned defending champ Southern in 2014 and then spanked Grambling in 2015 en route to the inaugural Celebration Bowl. After suffering a loss to Grambling in each of the previous two championship games, it will look to go above .500 on Saturday. ASU will become the first SWAC team to host a championship on its own home field when it takes on Southern. Southern holds the distinction of winning the first-ever SWAC Championship Game back in 1999, edging out Jackson State. The Jags have five appearances in the big game, beating Alabama State in 2003 and Jackson State in 2013. Their three wins are second only to rival Grambling. Would it really make sense for anyone else to be on top of this list? After Southern won the first SWAC championship, GSU went to three straight title games, winning them all under the guidance of Doug Williams. Williams is one of five Grambling coaches who have won SWAC titles at Grambling, including Melvin Spears (2005), Rod Broadway (2008) and Broderick Fobbs (2016), with another win himself in 2011 after returning. Broderick Fobbs led his team to back-to-back titles in 2016 and 2017. Grambling’s eight championship game wins are twice as much as the next closest team, Southern) and more than eight other teams combined.